Luxury Condo at Mission Lakes Country Club that blends city chic and modern functionality. The look is subtle sophistication from the cherry wood floors in the living room and bedroom, the granite flooring in the kitchen. Two Plasma TVs on the wall. Full Cable TV over 200 channels, unlimited 20 Mbps (super fast with wireless router take your laptop anywhere) Internet, unlimited local and long distance phone calls. This luxurious vacation rental offers you access to the Mission Lakes Country Club Condos pool and Jacuzzis. This resort size pool is perfect for all levels of swimmers. It ranges from 3 feet to 8 feet deep. MLCC Golf Course is a semi-private championship length course open to the public. From its signature holes, 1,500 feet above the valley floor, golfers are treated to a breathtaking panorama of mountains, emerald fairways and the valley below. The four finishing holes are considered to be the four toughest finishing holes in the desert. Also close to historic downtown Palm Springs this area has everything to offer; international cuisine, recreational sports, designer outlet shops (over 150), casinos, street fairs, flea markets, museums, music, movies and theater. Located just four hours from Las Vegas, and two hours from Disneyland and Hollywood. This unit just became available and won't last long at this price... so book your dates fast!! Hi my name is Vilen I'm very friendly, outgoing and love to spend time with my family. I chose to purchase this vacation rental place because of its beautiful atmosphere. It is very relaxing in Mission Lakes country club. I get to get away with my family and just have some time off and enjoy the sunshine, the climate and everything else that this place has to offer. My vacation rental is totally design for relaxation with modern and classic outlook, the country club has to offer all set golf course, two amazing pools, barbeque grills under Cabanas and tennis court. This is our second time staying in this condo and like the first we enjoyed it very much. Everything we needed was provided and when we did have a question or concern, Vilen responded quickly! The grounds are well kept as are the pool and hot tub areas. Very quiet at night. We hope to be back again. We really liked the area. Very quiet. The condo was nice but would have liked lighter colors. Everything was really dark. We travel to get away from the rain and cloudy weather so like light warm colors. The bed was hard but we purchased a thick mattress pad and that helped. Everything else was fine. Thank you very much for staying at our condo. And thank you for letting us know. The condo has extra windows for more daylight it's a side unit, not all units have extra windows. We did purchase a new mattress pad to make the bed softer. This condo was very clean and comfortable for us. If you’re planning to stay in Desert Hot Springs, which is the most affordable place in the Coachella Valley, this is where you want to be. The Mission Lakes Country Club homes and condos are ideally located for beautiful neighborhoods, views and an easy drive into downtown Palm Springs. The grounds are meticulously maintained and the pool and laundry facilities are always in great condition. There is a friendly vibe at the pool, and we found many of our fellow tenants had been coming to Mission Lakes for years. For a small monthly fee you also have access to the pools and restaurants at the Country Club, which we considered, but found ourselves so busy checking out all the fun places in Palm Springs, Rancho Mirage and Palm Desert that we didn’t need it. The condo had most of the basics there for us, and we quickly settled in for our two month stay. The owner responded immediately with any communication, but we only had one issue with an old cable box, which was replaced the very next day. My sisters came to visit and one slept on the sofa and the other used the fold up mattresses stored in the closet. Extra bedding was provided for two guests, and both sisters were comfortable and had plenty of privacy because there is a door separating the living area from the bathroom area. 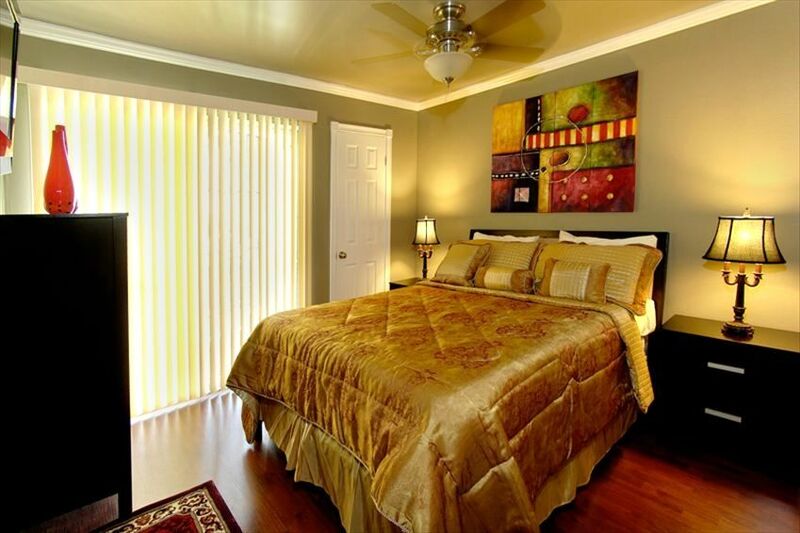 We would recommend this condo for anyone wanting to stay in Desert Hot Springs. Mission Lakes Country Club has 2 pools, the pool at the condos is free including jacuzzi 1-minute walk to the pool. The pool at the country club its about 10-minute walk and has an access fee. Country club access fee for the full stay is $125. It's optional and charged only if you need it. Country club access to the pool, tennis, and restaurant. Gym only for members. Everything else in the country club open to the public. Golf course open to the public, with very competitive prices in the area. Please visit Mission Lakes Country Club for prices. Very nice condo for a couple. We spent 2 months at Vilen's condo and we enjoyed it very much. This condo has everything you need for daily living. We would recommend it and will consider renting it in our future plans Thank you Vilen. An Excellent Rental in Desert Hot Springs! We really enjoyed our stay at Mission Lakes for the months of January, February and half of March, 2017. The condo is a nice size for two people, even having a storage room off the bedroom. The cable and internet were excellent! Having an ice maker was a real treat, particularly during the warmer days. A real plus was having a house phone, with long distance within the US and Canada. Vilen (the owner) was very accommodating and replied to inquiries promptly. Thanks, Vilen! I intended on staying 30 days... I ended up staying Apr - Sept 8.... The condo was quiet, clean and the owner was very professional and answered all questions within 20 minutes. Bed was very comfortable and plenty of extra sheets and towels. Condo is an end unit with plenty of parking within 50 ft of the condo. Close enough to Palm Springs without all the crowds... Pool and laundry area were always clean and pool was heated perfectly. I hope to get to stay there again! Owner was friendly and accommodating!